When starting out in squash we have so many things we have to think about that it can become really messy. To stop getting confused you can apply this simple 3 step formula. I make it Yell it to my students when they make these action so that they remember it easily. The 3 Steps: Open, Step, Swing. When making a shot, you always must Open before moving so that you're ready to hit the ball whenever you need to. Implementing this habit will give you the chance to forestall the shot you now usually miss. 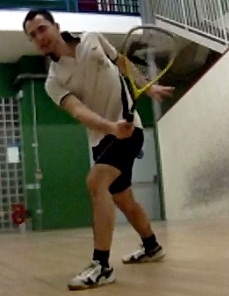 After your racket is ready to make a shot, you can move. When starting out the only thing that matter is that you make your last step in a way that lets you make a drive. To do so, simply make the last step with your left foot when on the right side of the court, and use the right foot on the left side of the court. When "landing" the feet make sure to make your talon gets to the ground before the sole this way you create a great base for you to make the shot. When making the last step you always have to make sure that you have your feet completely landed on the ground before making a swing. When you have your feet on the ground, you can easily make the swing. The best swing is the simplest, just extend the arm in front of you and use the shoulder to move it. Clearly we cannot work on our squash skills all the time, we have to choose one to work on so that we can get tangible results in a moderate period of time. This implies effort and time. Howhever when you go in court you should have one single objective to work on. Coherently with the principle of babystepping. To do so i reccomend you to read just one article in this blog, write down a squash skill to work and possibly an exercise to use in order to work on it. So what should you put first to work on in order to improve as fast as possible and as efficiently as possible? Work on this to make it as natural as possible. Start simple! 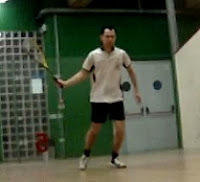 You can begin by simply hitting the ball against the side wall and using half of the racket swing. From the position of the impact point take the racket slighly back , you will use this position as a starting point for your shot. Take the habit of placing your racket in this position before trying to hit the ball. The best swing is the simplest, to make it just relax your arm and close your arm-pit for the forehand or open it for the backhand. It's as simple as this! When you know how to hit the ball decently you will realize that the way you orientate your body determines the direction in which you will throw the ball. 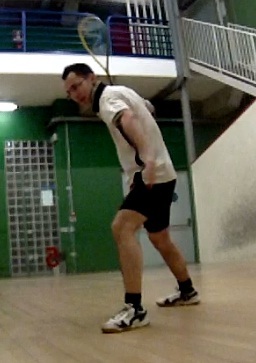 Hence you will have to work on how you position your body, this squash skill is crucial. The forward leg is the one closer to the front wall, it will determine how your body is oriented. Always have your left leg on the right side of the court and your right leg in the left side of the court. The other squash skill concerning court movement is that you always have to move back to the center. When starting out you will tend to wait for the ball and then run like a crazy. Instead you have to move constantly and slowly. If you know how the ball bounces you can save a lot of energy and improve your shot in the meantime. After you master this you can advance toward court movement advanced tactics. Don't worry too much about tactics when starting out, you'll soon learn them by playing. Although it's good to know that the more you throw the ball in the corners, the more your opponent will have to run. 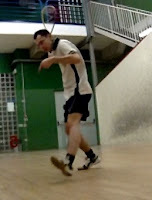 A great fun way to learn the tactics consist in watching squash games and making comment on them! If you want to learn more i made an in depth article on tactics. Start with simple things and work your way through. Persist and you shall learn! Once you got a grasp on the fundamentals of squash : Moving efficiently, Controlling the center, Throwing the ball in the corners. You have to implement this three concepts in every aspect of your game. The drive will be the foundation of all your exchanges in squash. The habit you have to develop is that unless your opponent makes it really easy on you with his shots, you have to make drive. This single habit will change your game drastically. Whenever you're near the back wall and your opponent is in the T, make a drive. When you don't know what to do make a drive. That's because and exchange of drives in squash is like the PAR in golf, you need to make at least a drive as good as the one of your opponent, otherwise he is leading the rally. All the other shots are less proficient than the drive, because if your ''reacting'' (he is leading) to your opponent and you make whatever shot, it will backfire on you. Instead the drive will always help you at least take control of the T.
The only thing you don't need is to throw the ball under the tin. You should always playing the best shot you can. But never force it, it's better to consume some more energy than to waste a point. This is a particular thing because when you'll begin to do this you'll end up loosing your matches because your depriving your squash of your aggressiveness. This is not what i mean. You have to always make the best shot you can, just never exaggerate. When you're thinking of anticipating your opponent's serve to make a Shabana style nick closure, think again and make a drive! Also you should never think that your shot will lead to a point because if proven wrong you'll loose the rally. There is an underlying concept in these habits: You have to be fit. Being fit is a prerequisite, otherwise everything in this article will be impossible for you, so focus on being fit first. Then implement a good respiration pattern, make it a habit to consciously manipolate your breathing when needed. Breathe deeply ,slowly and constantly when playing and make hard fast breaths between rallies. Considering that you have no reason to make mistakes and you must be an efficient moving machine on court you have to keep calm, and after every rally make a habit to reset your mind. Squash is so fast paced it is easy to become angry or loose focus, do the exact opposite, find a personal ritual that renews your focus and use it every time between rallies. Anticipating your opponents shot can be a powerful skill to have, but an even more powerful ability in squash is to know where your opponent is when you are making the shot and possibly tweaking your swing so that you trick him. When you'll have your Open and have your on court movements together you can start thinking of watching your opponent while your going toward the ball, this skill is incredibly powerful for if you know where your opponent is you can always make the right shot. A squash game is a combination of worlds (the rallies) but there are two constants: You and your opponent, proving that you're fit, calm and focused you should always be the one who is in better shape. This will be the determining factor when playing and you'll need to work on this one a lot. When it ends, it is ended. Psychological studies have proven that player that keeps themselves focused on the court tend to perform worse than player that when the game is finished just go away and focus on something else. I reccomend you to NOT be talking about what to do in the next game in your 90 second pause, instead do something you like, go talk to your girl, listen to empowering music or motivational speakers. Just think of something else! This way your brain will be more focused on the next game!